The Soviet war in Afghanistan was a war initially fought between the forces of the Afghanistan government and foreign mercenaries. 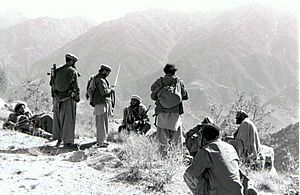 Without proper equipment and training, the Afghanistan government was unable to resist the foreign mercenaries, eventually seeking the aid of the Soviet Union.The entry of the Soviet Union into the country caused an immediate increase in the presence of foreign mercenaries. Massive military campaigns against foreign mercenaries, who blended in with the local population, caused extensive destruction of local infrastructure and death, causing the local population to side with the foreign mercenaries. This change, among the local population, caused a loss of support for the Soviet military presence, creating nation-wide resistance, and the eventual quagmire. The war began in December 1979, and lasted until February 1989. About 15,000 Soviet soldiers were killed, and about 35,000 were wounded. About one million Afghan civilians were killed. The anti-government forces had support from many countries, mainly the United States and Pakistan. The war started when the Soviet Union sent its 40th Army to fight in Afghanistan. They began to reach Afghanistan from 25 December 1979. The fighting continued for about ten years. 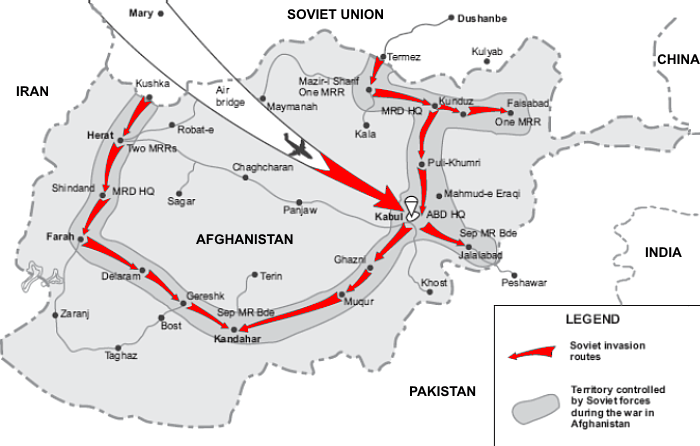 Then, from 15 May 1988, the Soviet troops started to leave Afghanistan. This continued until 2 February 1989. On 15 February 1989, the Soviet Union announced that all its troops had left Afghanistan. Arabs moved into this area in 731, and they were Muslim. Almost all the people of Afghanistan also started to follow Islam after that. The country has many mountains and deserts that make movement difficult. The population is made up mainly of Pashtun people, along with Tajiks, Hazara, Aimak, Uzbeks, Turkmen people, and some other small groups. On 22 December 1979, Soviet advisors to the Army of Afghanistan took many steps. They stopped all telecommunication links in Kabul. No message could come inside the city, or go outside the city. Troops of the Soviet Air force also reached Kabul. Amin saw some dangers. He moved to the Presidential palace for better safety. The palace was named Tajbeg Palace. The government of Afghanistan asked the Soviet Union many times to send troops. Despite the Soviet Union's treaty with Afghanistan to assist, and fearing a Vietnam-style quagmire, the Soviet Union resisted, instead telling the Afghanistan government to reach a compromise with the foreign mercenaries. As the situation deteriorated between the Afghanistan government and foreign merecenaries, the Soviet Union initially responded with only intelligence and advisors. People in most countries around the world did not like what the Soviet Union was doing in Afghanistan. But they liked the way the Afghan people were fighting them. Some reactions were very serious. US President Jimmy Carter said that the Soviet action was "the most serious threat to the peace since the Second World War". Carter threatened to boycott the 1980 Olympic Games in Russia unless the Soviet Union withdrew its forces by February 1980. It did not do this, and therefore the U.S. boycotted the Games. 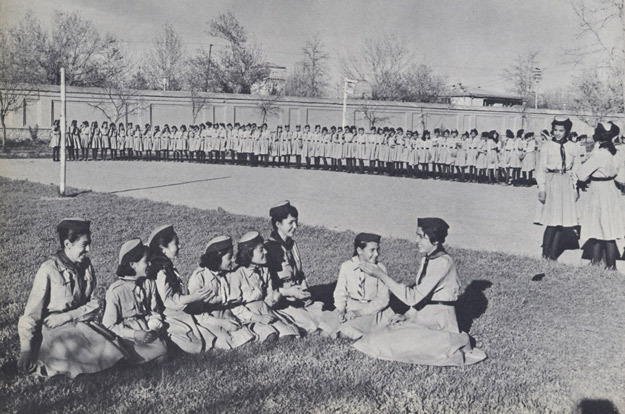 By mid-1980s, many groups in Afghanistan had organized themselves. They fought the Soviet troops. These groups received help from many countries like United States, United Kingdom, China, Saudi Arabia, and Pakistan. The Soviet war in Afghanistan seemed like a war that would never end. The Soviet Union looked very bad in the eyes of the world for trying to control this country. Inside the Soviet Union also, most people did not support this war. As more and more Soviet soldiers were being killed or wounded as the war dragged on, Mikhail Gorbachev would refer to the Soviet war in Afghanistan as a "bleeding wound". Finally, after ten years with no end in sight, the Soviets decided to get out of Afghanistan. Over 15,000 Soviet troops were killed in Afghanistan from 1979 until 1989. In the war, the Soviet Army also lost hundreds of aircraft, and billions worth of other military machines. Around a million Afghan men, women and children died in the war. Even after the Soviet Army left Afghanistan, civil war continued in Afghanistan. For about three years, the Communist government of Najibullah could not defend itself from the mujaheddin forces opposing it. Many groups had arisen within the government itself, and some of them supported the mujaheddin forces. In March 1992, General Abdul Rashid Dostam and his Uzbek militia stopped supporting the Najibullah’s government. Soon, mujaheddin forces won Kabul and started to rule most parts of Afghanistan. At the beginning, many people and countries had praised the USA for supporting groups fighting the Soviet forces. But after the September 11 attacks, people started to question the US policy of supporting and giving money to such groups. In an effort to find Bin Laden, the US has continued to fight in Afghanistan since 2001, and almost two years after Bin Laden was killed. 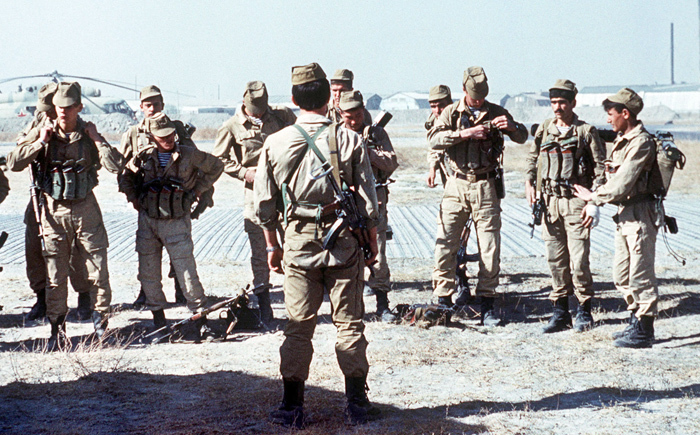 Soviet infantry at the time of deployment. 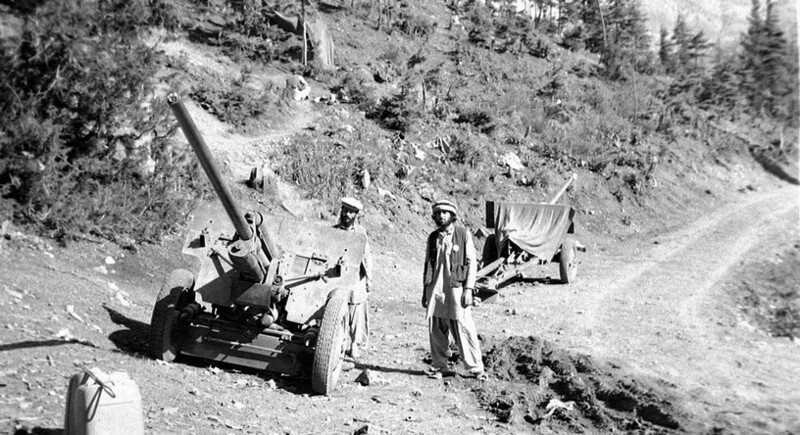 Mujahideen with two captured artillery field guns in Jaji, 1984. Charlie Wilson (D-TX), 2nd from the left, dressing in Afghan clothing (armed with AK-47) with the local Afghan mujahideen. 20th Anniversary of Withdrawal of Soviet Military Forces from Afghanistan. Stamp of Belarus, 2009. Soviet war in Afghanistan Facts for Kids. Kiddle Encyclopedia.